Hello all – Sean David Johnson here for Day 6 of the Big Sell 30 Day Challenge. We’re experiencing one new thing in pop culture every day, for 30 days throughout the month of October! If you were to ask me to name my favorite Michael Jackson song, three days out of the week I’d choose “Off the Wall.” From the very beginning of the song, Michael’s layered harmonies and that mischievous cackle let you know you’re about to hear something weird and wonderful. What follows is 3 and a half minutes of sublime pop. It’s one of the most life affirming, joyous, play this song right before you head out of the house on a Friday night creations in the history of music. 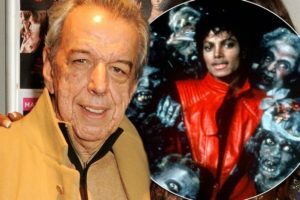 Of course – Michael Jackson and Quincy Jones deserve partial credit for this tune – but I can’t forget the songwriter Rod Temperton. Temperton passed away at the age of 66 last week. I’d like to take this opportunity to Big Sell you on his amazing discography. He’s best known for penning songs on Jackson’s masterpiece albums Off the Wall and Thriller. Those songs – “Thriller”, “Rock with You”, “Baby Be Mine” – make him one of the greats. But his musical career spans well before and after those albums. I’ve created a Spotify playlist featuring Temperton’s greatest songs. This playlist is a work in progress because as I research and read the numerous Temperton tributes, I’m continually discovering amazing songs I’d never known were created by him. Quite often songwriters are the anonymous heroes of pop music. I hope this post and playlist, along with all of the other tributes put this incredible talent in the spotlight.